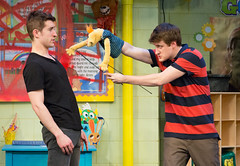 The Tony Award-nominated Broadway Comedy! Call Audience Services at 215.985.0420 x2 with any inquiries. We’re happy to help! I’m ready to subscribe now! I want more information. We can’t make this $#@% up. The good children of Cypress, Texas are taught to obey the Bible in order to evade Satan’s hand, but all hell breaks loose when Jason’s puppet at the Christian Puppet Ministry presents a shockingly sinister agenda of its own. 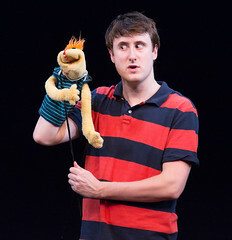 In this hilarious and lightning-paced comedy, a foul-mouthed sock puppet named Tyrone soon teaches those around him that a person’s darkest urges and desires fit like a glove, and Jason must re-define himself before the ventriloquist becomes the dummy. 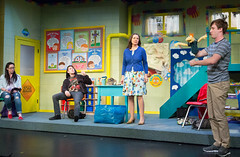 This irreverent Tony Award-nominated Broadway comedy hit inspires chills and chuckles as it unravels the fragility of faith. ROBERT ASKINS was born in Cypress, Texas. 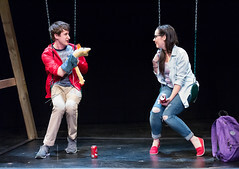 His Tony-nominated, Obie Award-winning play Hand to God ran on London’s West End (Olivier nominated for Best New Comedy) after it opened on Broadway in April 2015, following two critically-acclaimed runs at Ensemble Studio Theatre and MCC Theater, where it was named a NYTimes Critics’ Pick and called “the most entertaining show of 2014.” His newest play Permission made its world premiere off-Broadway in spring 2015 at MCC Theater. 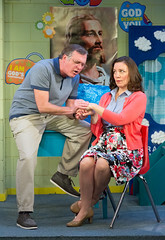 His play Fish Display was part of the 2012 Ojai Playwrights Conference and Permission was part of the 2014 conference. Rob has received two EST/Sloan grants, the Helen Merrill Emerging Playwrights Award, and an Arch and Bruce Davis Award for Playwriting. Rob is an I-73 and Youngblood alum and a graduate of Baylor University. He’s currently at work on two feature film projects and an original comedy series for HBO. ROBERT SMYTHE has been telling stories professionally for over thirty years, and is ready to use his experience as an actor, playwright, and director to fully engage your audience with his warm, confident, and believable voice. Considered one of Philadelphia’s most creative directors and producers, Robert Smythe and his work “sparked the theater renaissance that continues to this day,” according to the Philadelphia City Paper. A recipient of fellowships from the Guggenheim Foundation, the Pew Charitable Trusts, and the National Endowment for the Arts, Robert also received six Solo Performer Fellowships from the Pennsylvania Council on the Arts and six Barrymore Awards (as well as three additional nominations). Beyond writing, producing, and directing, Robert is also an accomplished performer and instructor. 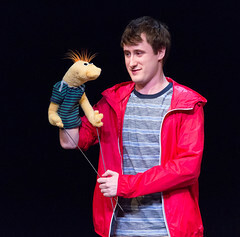 In 2011, he appeared on Broadway in The Little Prince, while Philadelphia Magazine named him “Best Professor” in their 2010 ‘Best of Philly’ issue. He was the first artist to receive a commission from the Philadelphia International Festival of the Arts in 2008, and his resulting collaboration with the Chamber Orchestra of Philadelphia, Stravinsky’s “I’Histoire du Soldat,” won the 2011 Barrymore Award for Outstanding Collaboration. 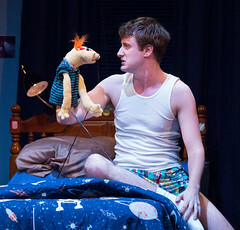 According to the Puppeteers of America, Robert is one of the most influential puppeteers in the United States, widely acknowledged to have changed perceptions about puppetry and theater. He was the founder of Mum Puppettheatre, Philadelphia’s largest small theater and the only regional theater in the United States dedicated to puppetry. He served as Mum’s Artistic Director for 23 years, during which he wrote and directed over twenty original productions using puppets, masks, and human actors. Many of these shows were also performed on tours throughout Europe, Japan, and Central America, and collectively won thirteen Barrymore Awards. 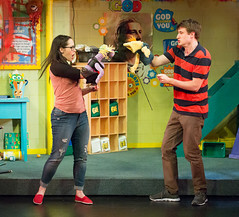 In addition to his work for Mum, he has directed and designed puppet work for theaters throughout the region and across the country, including the Arden Theater, the Wilma Theater, Interact Theater Company, and the Minneapolis Children’s Theater. He has created four original concert works with the Philadelphia Orchestra; one of these, Swan Lake, won the 2003 Barrymore Award for Outstanding Collaboration of the Year. 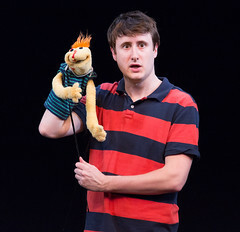 From the Ashes, his original play for masks and puppets, was named “Pick of the Fringe” at the Edinburgh Fringe Festival in 2001 after winning three Barrymore Awards. From the Ashes also won Robert his first of three Citations for Excellence in the Art of Puppetry from UNIMA-USA. In 2002, his choreography for Mum’s landmark production of Equus was awarded both the Philadelphia dance community’s “Rocky” award and the Barrymore Award for Outstanding Choreography. In 2013, he served as Director of the National Festival of the Puppeteers of America. 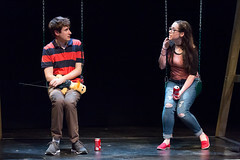 4/13 and 4/27 Our post-show MTA events allow the audience to learn about the process of each production with an onstage Q&A session with the cast. 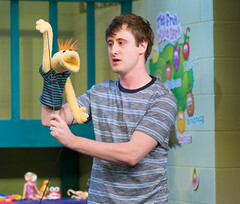 4/18 The Created Actor: Puppetry in Theater - Join us post-show for a talkback with our puppet designer/director, Robert Smythe. 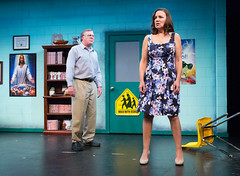 4/22 Join a member of PTC’s staff for a post-matinee backstage tour of the set. Learn how the set was conceived and built, and how the crew runs the show! ALL EVENTS ARE FREE - LEARN MORE HERE.